I’ve combined two of the best things in life: chocolate and cookie dough. This Chocolate Cookie Dough Fudge recipe will have you drooling in no time! No candy thermometer needed! Every once in awhile I find myself coming home from the grocery store with random items. A box of Noodle-Roni, a can of spaghettios and meatballs, or a package of refrigerated cookie dough. While I normally am in the “from scratch” camp, I do occasionally give in to packaged foods. And if I’m being honest…there are a few things from childhood that I love! For example: Bologna. I love it. I buy it maybe once every couple years…but oh man, yum. Take a piece of toast with butter, toss your bologna in the microwave for about 15 seconds and then on top of the toast. Good grief I should be ashamed of myself for admitting this! Boxed mac and cheese. While I love homemade mac and cheese, more than nearly any other side dish…I can’t help but purchase this blue box. And when I make a quick box for my kids, I find myself shoveling forkfuls into my mouth! It’s what I lived on in college! This dessert blogger has a confession. One of my husband’s favorite desserts is a roll of cookie dough, broken into small balls. I drop those into a mini muffin tin, bake and immediately press a Reese’s Peanut Butter Cup into them. Two ingredients. Zero work. ONE happy husband! Last month I found myself with a roll of said cookie dough and no peanut butter cups. I tossed that roll of cookie dough into the freezer, thinking to myself, I’ll take it out some other time when I’m fully stocked up on pb cups! A week later, while making some Macadamia Nut Fudge, the thought came to me, what if I stirred in some hunks of frozen cookie dough into my milk chocolate fudge? Would it stay solid and not melt? Would it taste good? 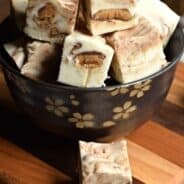 I know how to make chocolate fudge, but how do I make cookie dough fudge? I immediately got to work in the kitchen and tested those thoughts. My sweet tooth wanted me to make a Chocolate Cookie Dough Fudge. As it turns out, it was perfect. The cookie dough stayed soft (not melted) and the creamy chocolate fudge was the perfect pair. If you have a cookie dough lover in your house, you must try this!! And then you have to confess to me what your childhood favorite food is, even if it’s embarrassing. Don’t leave me hanging out to dry by myself! First, make sure your cookie dough is FROZEN. Very important! PRO TIP: Use binder clips or mini clothespins to secure the parchment paper to the dish! Crumble chunks of cookie dough into the bottom of the baking dish. Use about half of the dough and about 1-inch chunks. Set aside. In a large mixing bowl, add milk chocolate chips and marshmallow cream. Set aside. In a large saucepan, combine sugar, milk, butter, and vanilla. You can use heavy cream in place of the milk if you prefer. Bring to a boil over medium high heat, stirring constantly. Boil for a full 2 minutes, still stirring. Pour the boiling mixture over the milk chocolate chips and marshmallow. Blend with whisk attachment (hand mixer or stand mixer) until mixture is smooth, about 1-2 minutes, scraping down the sides of the bowl as needed. Pour into baking dish (over the top of the cookie dough). Press small chunks of the remaining cookie dough into the top of the fudge. Chill 4 hours. Cut into pieces and enjoy. 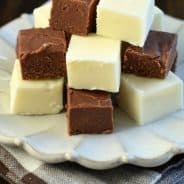 Store fudge in airtight container at room temperature for up to one week. 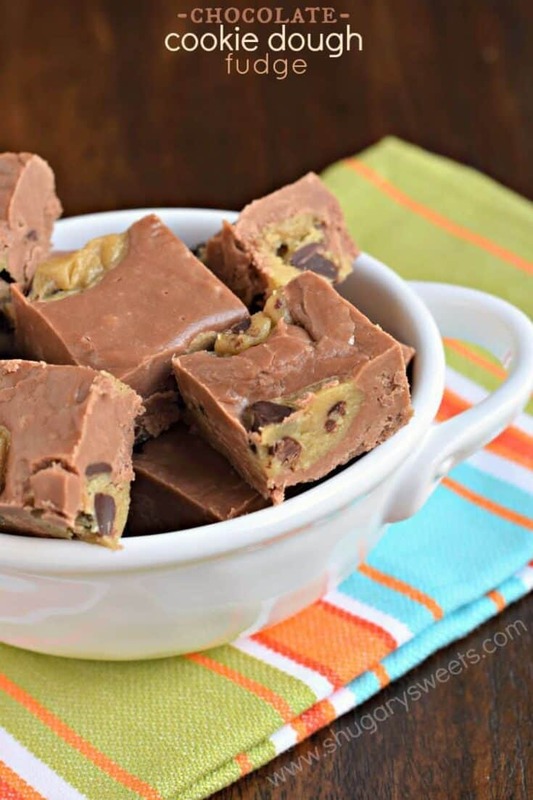 Can Chocolate Cookie Dough Fudge be frozen? Once the fudge has cooled, slide into an airtight container or ziploc freezer bag. Press out all the air and close. When ready to use, thaw overnight in refrigerator. Cut and enjoy! If you love sneaking bites of cookie dough, this Reese’s Peanut Butter Cookie Dough Dip is decadent and drool worthy. Serve it up with pretzels or apples and watch it disappear! I've combined two of the best things in life: chocolate and cookie dough. 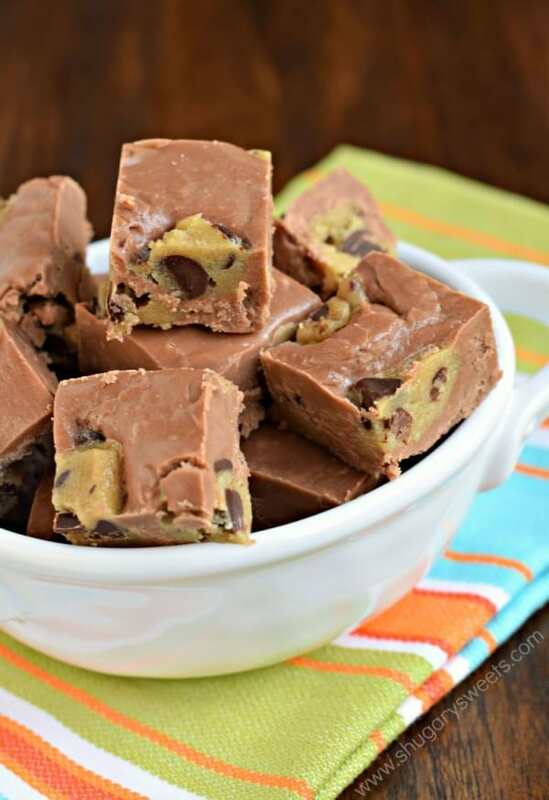 This Chocolate Cookie Dough Fudge recipe will have you drooling in no time! 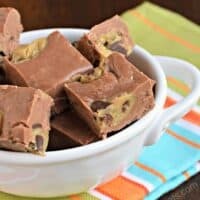 *This Chocolate Cookie Dough fudge recipe was originally published on Shugary Sweets on August 13, 2015 and has been republished in April 2018. I thought putting cookie dough in the fudge was genius enough, but I LOVE that I can use premade cookie dough because honestly when I’m not baking for the blog, I like to take shortcuts! Wow, you never cease to amaze me with your delicious treats and food. I absolutely love so many of your recipes. Have never been disappointed with any I made. (oops made several times). It is obvious you love sweets as do I and my friends and family. I totally agree about the cookie dough and macaroni and cheese! love that stuff. I like how easy this recipe is, too! Two of my favorites in one awesome bite! 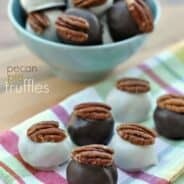 Love this fun fudge treat!! My go to eats from childhood are the boxed mac and cheese, canned ravioli, and brownies from a box!!! Looks delicious! I just introduced my kids to fried bologna sandwiches and they are totally hooked! I make them with my bread toasted, mayo and cheese! Yum! Oh the food memories–and I admit that sometimes I crave (and give in to) the blue box! 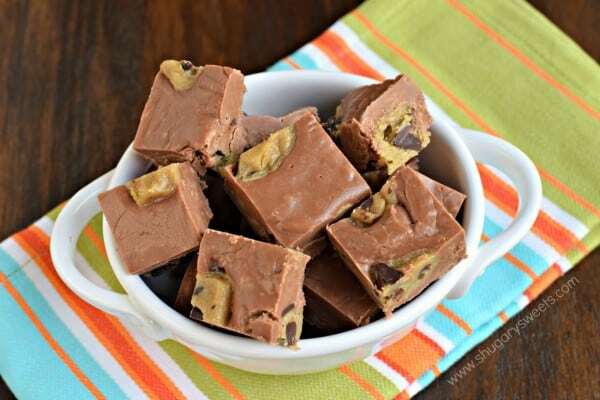 And cookie dough anything is one of my favorites, so to put it in fudge is fabulous. I absolutely love your site, Amy, so I almost hesitate to chime in here. But as an avid cook and baker (including former baker for a school district), please be careful using prepackaged dough (which has a label warning). While the risk of food poisoning is small, it can have very serious consequences–especially for children, pregnant women, and the elderly. Many people don’t realize that the worst food-borne illnesses can’t be detected by sight or smell, so warnings are ignored because they seem inconsequential. But an Ohio church in April (this year) had a botulism outbreak (many sick, 1 death) due to home-canned potatoes used to make potato salad. E. coli and salmonella are the usual culprits in packaged items, and they show no outward signs of contamination on foods either. Best bet–make your own egg-less dough (there are great recipes out there) or use pasteurized-in-the-shell eggs. I too love cookie dough, so finding a “safe” recipe gave me a massive smile. It will be perfect to use in your recipe, and I know the church family will love it too. Thanks for the chocolate deliciousness that will ensue! OH my gosh. Yes, yes you have combined the best things in life!! 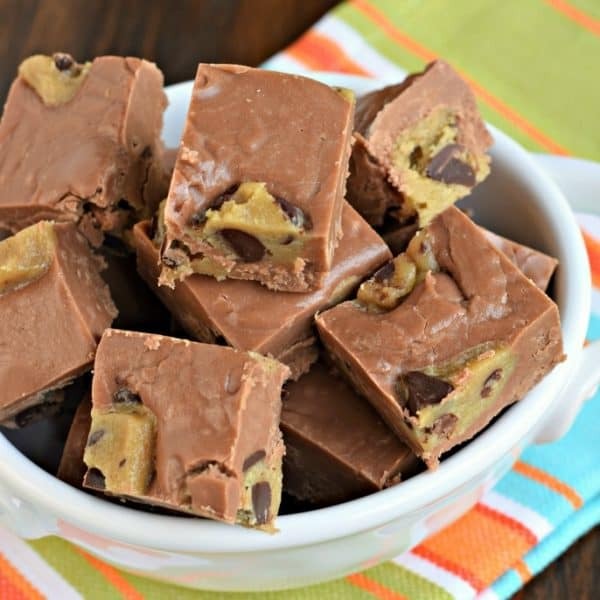 Cookie dough fudge is GENIUS!! Yes! Totally the best things in life! Love this fudge! I am in love! Two of my favourite things in one tasty treat. Amazing! Umm, that cookie-dough-reeses idea sounds AMAZING and I think it deserves it’s own blog post. Just sayin 🙂 I’m loving this fudge Aimee!! I want that whole plate right now! I love bologna, too. My husband thinks it’s gross, and so do I, but I give in now and then. It’s so good on white bread! And those PB cup cookies sound like my crack. Cookie dough in fudge?! What a brilliant idea! Genius! This is the ultimate fudge Aimee! oooooooooooooh cookie dough and chocolate fudge! be still my sweet-lovin heart!